Cloud Drive Mapping Tool - Replaces local hard drives & file servers. Works like your local hard drive / file server. Map cloud storage as a network drive. Directly edit cloud files, drag-n-drop email attachments, file locking, map multiple drives with different permissions. Very efficient & reliable. A mapped cloud drive is the most straight-forward way of accessing cloud based files. It works just like your local hard drive. There is no learning curve. 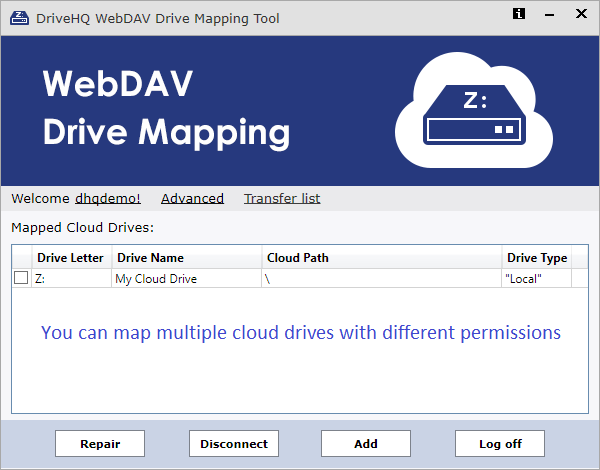 DriveHQ's Cloud Drive Mapping Tool makes it extremely easy to map a cloud drive. Moreover, it uses advanced caching, monitoring and reparing technologies to make the solution more efficient and reliable than any other WebDAV drive mapping services. Map cloud storage as a "local" drive. A mapped "local" drive is more compatible with Microsoft Office. Enhanced Drive Monitoring feature - the Drive Mapping Tool automatically repaires disconnected cloud drives. Supports longer file path. The path length limit is a limit of Windows operating system and Microsoft Office. The Drive Mapping Tool minimizes the path length. Map cloud storage as a network drive instantly. Directly edit cloud files as if they are local. Drag-and-Drop download / upload files and folders. Attach files to Outlook or save Outlook attachments to the mapped drive. Map multiple cloud drives with different access levels. Share folders to different users / groups with various permissions. Support groups and sub-groups; support companies with over 10,000 employees! Advanced caching that brings performance nearly on par with local drives. Automatically compress data for faster uploading / downloading. Using DriveHQ's MagicUpload technology, upload speed can be many times faster in certain cases. Can upload/download very large files. File transfer list with detailed progress info. Built-in error logging and trouble shooting capabilities. 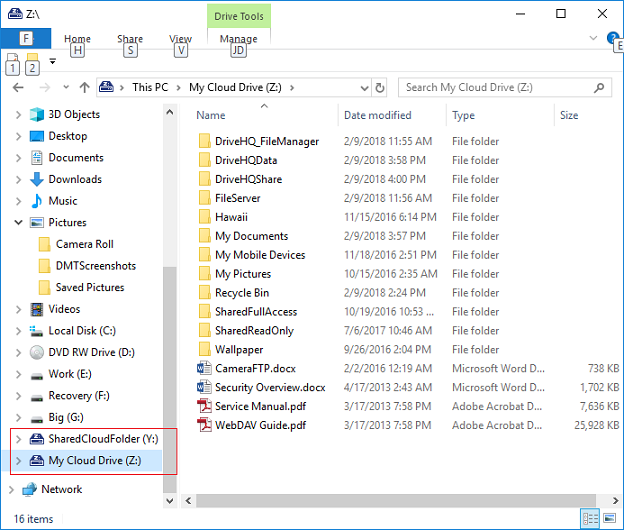 Pre-configured drives: a Group Admin can create a configuration file for sub-users to automatically map certain cloud drives. Support Active Directory Integration, Single Sign-On (SSO) and Two-Factor Authentication (2FA).